An extensive ridge finally collapses as several short waves spread across N and W Europe on Friday. One of these troughs will cross central Europe and N Balkan peninsula, associated with S-SEwards moving cold front. Another short wave moves towards NW Iberia. 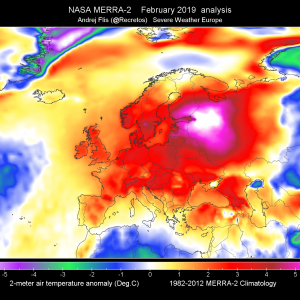 A very cold upper low moves into N Scandinavia. An ENH risk has been issued for parts of N Norway with threat for non-convective severe winds with gusts 120-130 km/h locally. Isolated electified convective cells are possible due to the very cold core of the upper low moving into N Scandinavia. A SLGT has been issued for surrounding areas of ENH risk with non-convective severe winds gusts up to 100 km/h. A WNTR risk has been issued for higher terrain of N Norway in extreme N Sweden where excessive snowfall up to 50 cm is expected. A SLGT risk has been issued for parts of NE Adriatic sea with threat for isolated severe storms along the southwards moving cold front. A marginal threat for severe winds exists. 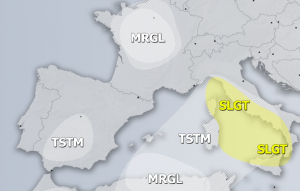 A TSTM risk has been issued for parts of N Adriatic sea extending from the Italian coast across the sea towards the Kvarner area in W Croatia. 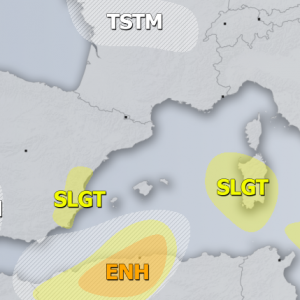 A TSTM risk has been issued for areas NW of Spain for a few isolated storms.